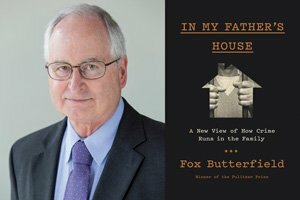 Review: In My Father’s House: A New View of How Crime Runs in the Family. By Fox Butterfield. Knopf. 288 pages. 978-1400041022. Over four generations, starting in 1920, 60 different members of the Bogle family, originally from Texas and now based mostly in Oregon, have at least one time, and often many times, been placed on probation or parole, sent to jail, prison, or juvenile reformatory—and in some cases all of the above. Only the rare family member has no rap sheet. Their repeated infractions and felonies represent a catalogue of crime, ranging from fraud and burglary, to physical and sexual assault, to arson and murder. Several have lived (or, by the end of their lengthy sentences, will have lived) a larger percentage of their lives incarcerated than free. Even before they left home for the first time, often for the reformatory, their daily diet growing up was heavily seasoned with abusive parenting and neglect. Their formal schooling was nil, but they received extensive homeschooling in the arts of scamming and stealing.